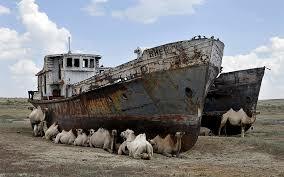 I have read about the Aral sea in a few documentaries and articles in the past. In this article I want to give you the whole story and after effects of this incident that has permanently affected the Russian environment and economy. This epidemic dates back to the early 1960’s where the Soviet Union still had siege over Russia, the Soviet government’s Communist ideology ran the country at the time so we saw major increases of jobs and agriculture-feeding the citizens became a major topic for communism. The Aral Sea is located between Kazakhstan and Uzbekistan in Central Asia; the area was actually a once booming fishing and transportation industry, fishing towns boomed all over the coasts; people thrived off of this product. When the Soviets took control, they wanted to start up the agriculture business for the country, they began to cut off the Amu Darya and Syr Darya rivers, which flowed into the sea and also they creating canals to irrigate water into the agriculture fields. This plan worked for a while, until the Aral sea started to recede dramatically, the sea is currently now 10% of its original size, the size change is insane because it has only been less than 30 years for this massive sea to recede that much. The citizens who live by the sea have took notice, they began to protest because there fishing and boating business has “dried up”-pun intended . If you were to look up pictures of the sea, you would be able to abandoned/beached boats that once sailed the Aral sea’s water. You would also see pictures of the old lifeless fishing villages. Those fishing villages barely survive on the remnants of fish that still roam in the sea. The Aral sea’s size has condensed so small, that some drier areas of the sea have been overtaken by salt mines. The mines regularly drill into the area because it’s an everlasting source salt, there it is so much salt that compacts into this area it is almost impossible to drill all of it out. The new Russian and non-communist government has started taking notice of this crisis. The have created programs that concentrate on re-fueling the Aral Sea with sea habitants and water. Vice(video isn’t Vice) has done documentaries about the newly formed fish nurseries that help replenish the fish population, we are slowly to see a comeback of fisherman and fishing towns. The waters are still too small and shallow the big barge ships to comeback due to the massive amount of space that is needed. The Worlds Greatest Environmental Tragedy…and the Comeback by Ethan is licensed under a Creative Commons Attribution-ShareAlike 4.0 International License. Big Lies, Small HandsWhich Ninja Turtle are you?